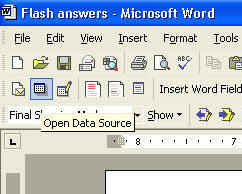 In the "select data source box" use the drop down menu to find the folder where your flash card files are saved. 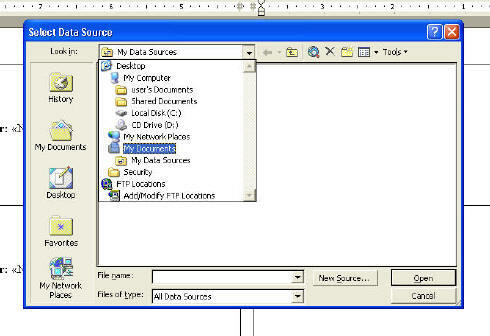 By default, Office XP creates a folder called, "My data sources." Your flash card folder my be saved in a different folder. You DO NOT have to select this file. Find the folder that you saved all your flash cards in. 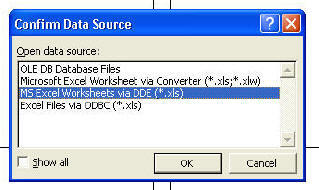 Highlight the Excel database and click "ok."
In the box "Confirm Data Source" Select, "MS Excel Worksheet via DDE (*.xls)," Click "OK". You should now have your question or answer template open and your database minimized at the bottom of your screen. You are now ready to merge the documents. Click on "Merge to New Document" Icon in your toolbar. The blue shaded icon in the screenshot below. Your flash cards should now have your questions or answer on them and you are ready to print!